He tried to sell the bill as all things to all GOP senators—and he got caught. It’s tempting to use the photos of Donald Trump sitting in a fire truck Monday afternoon, as the GOP’s plans to “repeal and replace” the Affordable Care Act went up in flames, to symbolize the way Republicans have so far bungled their party’s top legislative priority. The photos are ridiculous. But while our unfit president didn’t do much to advance the Senate bill—he was hosting a dinner with top GOP supporters of the bill Monday night, and then they were blindsided by the defection of two conservatives, Senators Mike Lee and Jerry Moran—the real fault lies with the steely, shifty, heavy-handed approach of Senate majority leader Mitch McConnell. 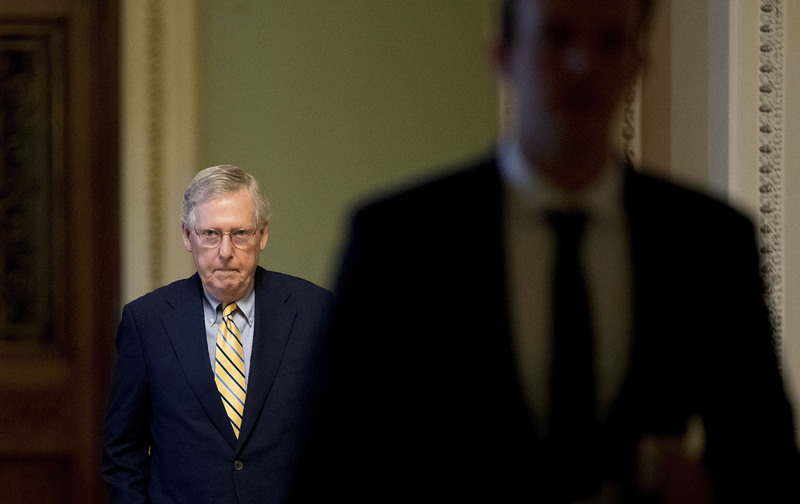 Widely considered a brilliant tactician, in fact McConnell has never had to craft conservative legislation that would survive in the real world, as long as President Obama stood ready with his veto pen. Now, with control of the House, the Senate, and the White House, Republicans have had to confront the anti-government derangement that animates the party’s right wing—while so-called moderates and even some conservatives come to terms with the ways that their constituents increasingly rely on government assistance, especially the ACA, and don’t want any part of House Speaker Paul Ryan’s fantasies of a world without Medicaid. Republicans are finally being forced to deal with the anti-government derangement that animates the party’s right wing. With the “help” of Senator Ted Cruz—widely considered the least popular man in his caucus—McConnell tried to sell the bill as all things to all GOP senators, and he got caught. One big embarrassment was his reported promise to Senators Shelley Moore Capito and Rob Portman that the bill’s unpopular long-term structural cuts to Medicaid would never be enacted. Senator Ron Johnson, no moderate and normally a McConnell ally, blasted the claim as “a significant breach of trust.” McConnell has denied the promise, but the fact that Johnson is angry enough to call his leader out publicly shows that McConnell’s style is wearing on his caucus. “Accusing your leader of ‘a significant breach of trust’ is about as harsh as you get in Senate-speak,” tweeted Adam Jentleson, a former Harry Reid staffer who now works for the Center for American Progress. The unexpected defection of Kansas Senator Jerry Moran, a staunch conservative and McConnell ally, symbolized the leader’s clear loss of control. On Tuesday morning, McConnell struck back, promising to revive the repeal-only bill that the Senate passed in 2015, which Obama vetoed. But he sounded like an angry high-school teacher chastising unruly students, instead of a leader trying to mobilize demoralized colleagues. He seemed to be daring his caucus to vote against a bill they’d previously supported, and preemptively calling them out for hypocrisy. And it’s true: Most Republicans were happy to pass repeal bills when they knew they wouldn’t become law. But, with his inability to craft a replacement once he assumed real power, McConnell is shown to be the hypocrite in chief. His tone was more threatening than cajoling, and it seems the threat won’t work. Already Maine’s Susan Collins, who voted against the 2015 repeal, has come out against a McConnell’s plan; Capito, who supported repeal in 2015, quickly joined Collins in opposition, as did Alaska’s Lisa Murkowski. Portman likewise sounds like a no, telling MSNBC, “If it is a bill that simply repeals [Obamacare], I believe that will add to more uncertainty and the potential for Ohioans to pay even higher premiums, higher deductibles.” He added: “I’ll take a look at it, but I’m concerned about something that would simply repeal, and its impact on cost and choices.” I’d expect even more defections by the end of the day. Meanwhile, Trump has been tweeting erratically about the defeat. First he declared support for a repeal-only bill, breaking a major campaign promise, then he seemed to want the GOP Congress to “let Obamacare fail,” which sounds like he’s telling them to do nothing. Whatever happens next, the truth is that Trump won’t play much of a meaningful role. This is a great victory for the activists who organized and called their senators and flocked to town halls and sat in and got arrested in the last few months. Yet it must be said: The Resistance can’t rest. None of us will forget the way the House bill appeared to die, and then like a zombie rose from the dead and won a majority. In tribute to director George Romero, who passed away this week, it’s possible that the Senate bill is another example of the “living dead.” But McConnell’s reputation as a smart legislative tactician has taken a hit, and his ability to round up votes for a bill that would strip coverage from 32 million people—as opposed to the 22 million the failed Senate bill would have hurt—now seems limited.